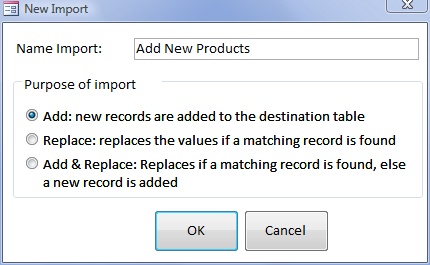 This tutorial shows how to create an import to add new products from a supplier to the Products table. In the transfer pane, an initial matching is done of Source and Destination fields. Difficult to miss is the orange bar in the SupplierID row. The orange bar indicates there is something wrong with the value that would go into that field. The reason here is simply that a value is required for SupplierID. This can be seen of you switch to the [Start Import]tab and look at the yellow [Comments] text box. If you open table Products in design mode you will see field SupplierID has property Required = Yes. 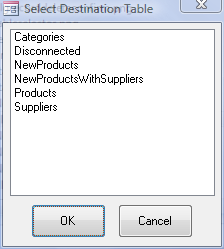 CategoryID does not turn orange because it is not a required field. The orange bar dissappears - you will be able to import the records now. Notice the progress bar and counters.